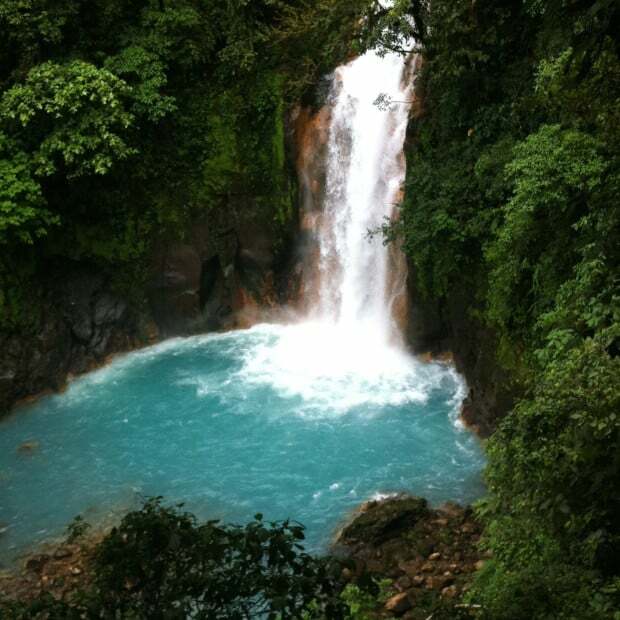 TENORIO NATIONAL PARK, Guanacaste — The water is so blue, you’ll think your eyes are playing tricks on you. 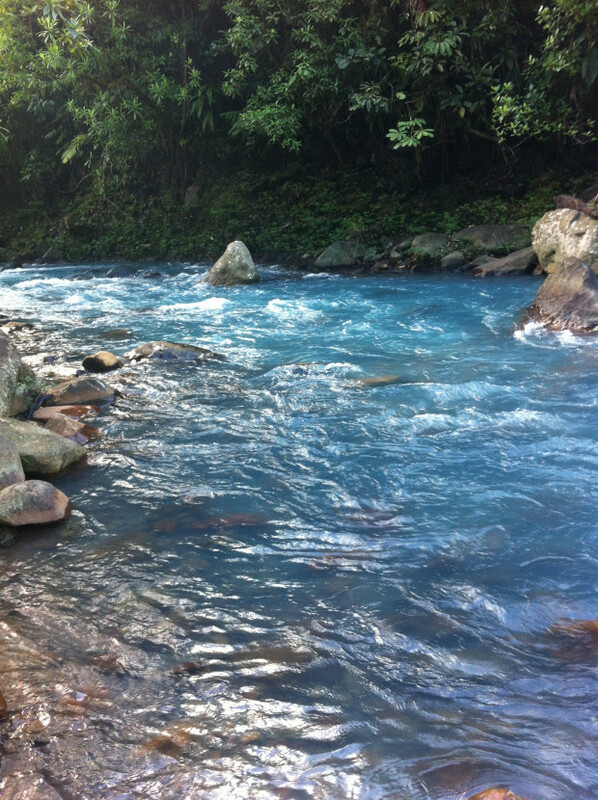 And that’s what makes Río Celeste (“Sky-Blue River”) the spectacular centerpiece of Tenorio National Park, an often overlooked treasure in northern Costa Rica. 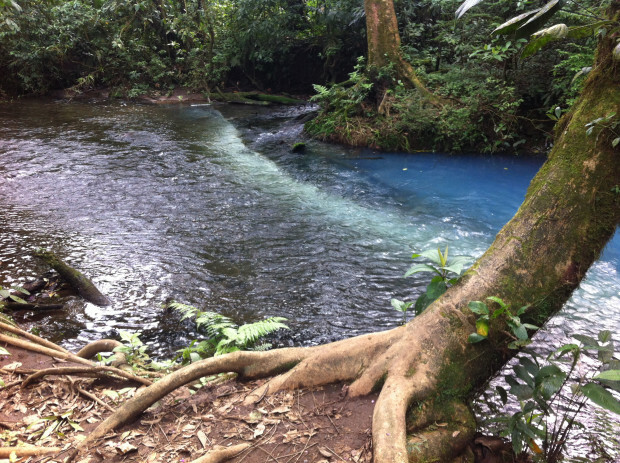 Most rivers are brown, green or clear, but Río Celeste is weirdly blue —in places blue like the sky, in places blue like the bluest blue in a box of crayons. I showed up at the entrance to the park after driving two or three hours from Rincón de La Vieja, planning to spend the night at the $12 Río Celeste Lodge and visit the park in the morning. “Yo le recomiendo que lo hagas hoy,” said a park ranger at the entrance (“I recommend you do it today”). He said tomorrow there could come an aguacero, a downpour, and the park would be muddy, the trails would be slippery and the water would be brown. But today, he said, the weather was great (it looked a little overcast to me), and he showed me his boots, which had collected almost no mud from tromping the trails today. “¿Y el río?” I asked. How did the river look? “Perfecto,” he said, with an A-OK hand sign. “¿Y estoy bien con estos zapatos?” I asked, inquiring whether my closed-toed sandals were sufficient to the task. I had read in one travel book that because of the mud here, hiking boots were essential, and I had gone out of my way to buy some. Settled. I paid the $12 admission, glanced at the map I was given, and entered the park, where I found an easy hike on well-maintained trails through virgin rain forest. 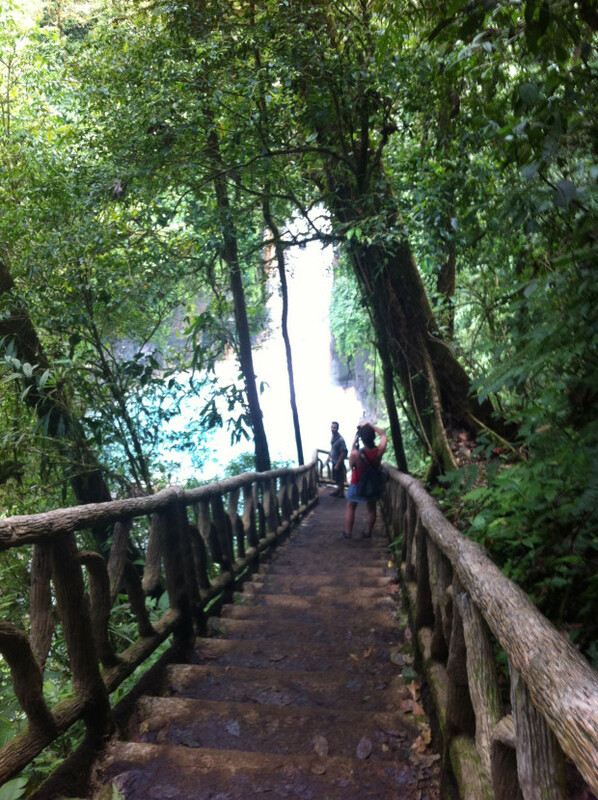 If you come here, don’t even think of skipping the first turnoff to the left, toward the catarata, the Rio Celeste Waterfall. 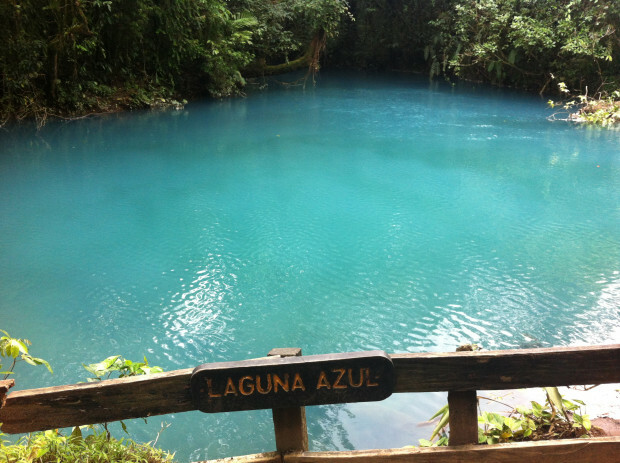 It may be the most beautiful you’ve ever seen, with the unique blue pool at its base. The stairway to the bottom is well-built but very long (just wait until you tackle it from the other direction), but the views from the stairs alone will stop you in your tracks to take pictures. At the bottom is a fenced viewing area with a dramatic view of the waterfall, and here the pool at the base is aquamarine. They say Llanos de Cortez, not far from here, is the most beautiful waterfall in Costa Rica, but it would be hard to compete with this one. Unfortunately, there is a “Do Not Enter” sign prominently displayed on the railing of the viewing area, so well-behaved visitors go no further. Later I learned that there is a trail to the bottom of the waterfall, but I never saw it. After the waterfall comes a mirador, a lookout structure where you can view Volcán Tenorio and, I’m told on a clear day, even Lake Nicaragua. But in an environment like this, you must remember that volcanoes attract clouds like magnets attract iron filings, and this was the case when I visited. The next stop is the Blue Lagoon, a lovely photo op of a still, wide place in the river where the water puts its blueness on full display. Then comes “Borbollones,” “the place where the water bubbles,” with a little corner of the lagoon near the bank bubbling furiously because of smelly volcanic gas venting into the bottom of the river and breaking to the surface. It looks like the water is boiling hot, but it’s lukewarm to the touch. 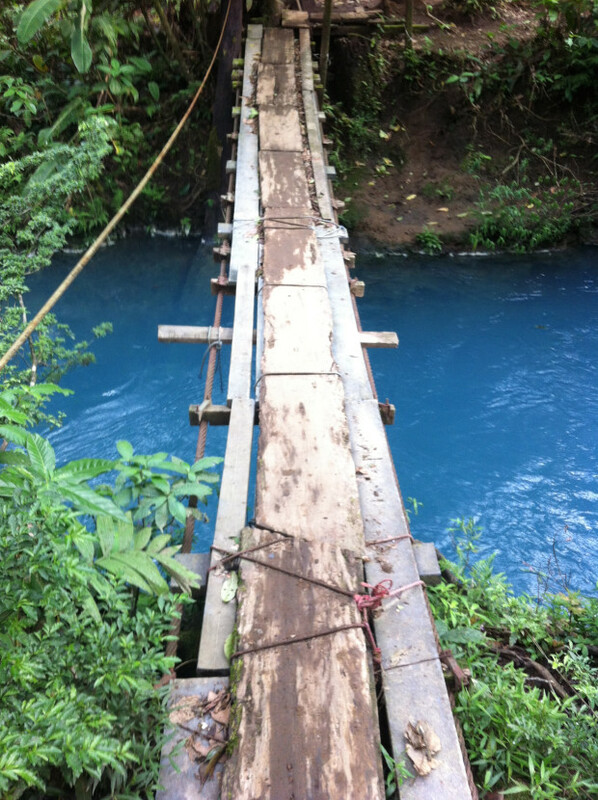 This wouldn’t be Costa Rica without a suspended bridge or three, but by the time you reach the third you’re stretching the definition of “bridge” — it’s a crude plank across a brilliantly blue river, with no railing and only one rope to hold onto. Stopping in the middle of this bridge to take a picture, I almost fell into the river. This would have made a hilarious video. At the very end of the trail is Teñidores, “the dyer’s place,” and here you’ll see a very strange sight. This is where ordinary rivers go to dye. 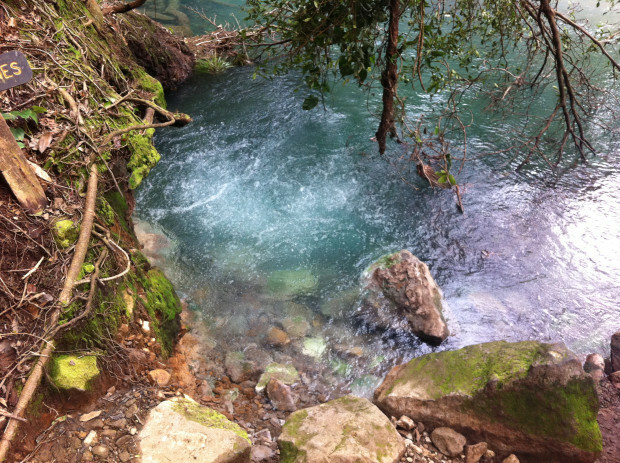 Two rivers of normal color collide here and become one — and immediately downstream, the water turns bright blue. A sign facing this weird visual explains: Suspended particles in one river called alumino-silicates collide with another river, laying down a visible line of white sediment at the bottom of the confluence. But just downstream, these same sediments float into the current at just the right size and with just the right chemical properties to reflect the spectrum of the sun in only blue — giving this river its spectacular color. Be forewarned that the river may be muddy and brown when you arrive. The best time of year to see Río Celeste actually celeste is December through April, the so-called dry season, but be advised that it rains here cuando Dios quiere, and the river may be blue or brown at any time. 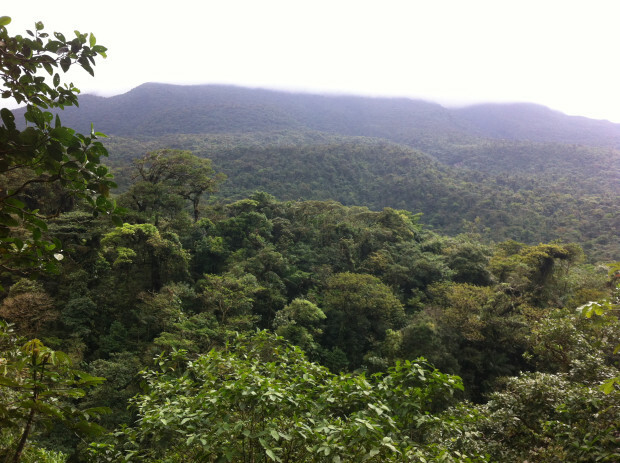 Tenorio National Park encompasses 12,830 hectares, but its primary attraction is one easy, 2- to 3-hour trail, the same route in and out (so you can’t get lost, and you don’t need a guide). For this reason, Tenorio makes a great day trip from elsewhere — after the midday hike, there’s little reason to spend the night unless you hire a guide to take you on a special excursion. A guide at the national park headquarters at closing time, Enrique Méndez (kikemendezr@gmail.com) told me he can get permission from the rangers to take people 3 km past the end of Teñidores to the “Three Waterfalls Trail.” He said they once set up a camera there. “There’s a tree trunk fallen across the river, and we saw seven species crossing the river there,” he said — coatimundi, agouti, squirrel, armadillo, margay cat and a tolomuco, or tayra, a type of weasel. (I missed the name of the seventh). Méndez said he could also take me to a place called Los Quemados — “The Burned Place” — where there is bad gas venting from the ground, possibly carbon dioxide, and where no trees grow. He said there are dead animals and the skulls of rabbits there, and he offered me an 8-hour tour for $40. Tempting. But what I really wanted to do the next day was drive to Arenal and check into a hotel where the hot water and Wi-Fi worked, because they weren’t working back at my place, and I was jonesing for both. The next morning, asking for directions to find my way to Arenal, I picked up a gentleman needing a ride to Upala, who wanted to sell me his finca, his ranch in the middle of this spectacular wilderness. Getting there: With your own car, take the Inter-American Highway north from San José or south from Liberia, and watch for the sign pointing to Tenorio National Park just north of Cañas. Go north on Highway 6 to Bijagua, 35 km away, and watch for the sign in town pointing east toward Tenorio. Buses also run to Cañas from San José and Liberia, and a bus from Cañas to Upala stops at Bijagua. 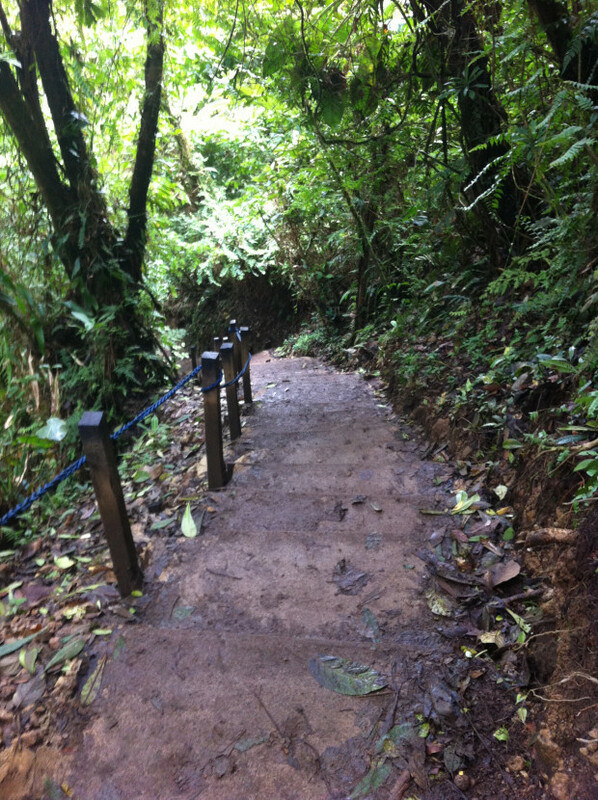 Day tours: You can also explore Río Celeste on a day trip from Arenal or elsewhere; contact Desafío Adventures (www.desafiocostarica.com) or Canoa Aventura (www.canoa-aventura.com). Hours: Visitors are admitted from 8 a.m. to 2 p.m. every day. Admission: $12 for foreigners, 800 colones for Costa Ricans. What to bring: Be prepared for rain, mud and insects with good hiking shoes, long pants, raincoat and insect repellent.